The Accu-Cull Digital Scale makes weighing fish easy. With the scale measuring up to 55lbs and includes a 38" tape measure in the handle you have the best of both worlds in one product. Accurate to the 1/100th of one pound this scale will not let you down when it counts. Excellent brand name scale, easy to use, stow plus make quick length measurements. 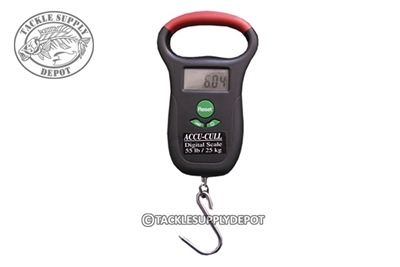 Very reasonably priced at Tackle Supply Depot with outstanding speedy delivery.